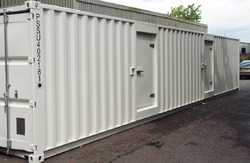 Our range of products include sound - proof enclosure, sound proof containers, sound proof generator container, acoustic container, blowers acoustic enclosures and compressors acoustic enclosures. SRG International offering significantly Sound - Proof Enclosure, Acoustic Hoods, Acoustic Enclosure, Acoustic Hood for Blowers, Acoustic Hood for Compressor, Acoustic Hood for Cranes, Sound Proof Driver Room, Sound proof Enclosure, Acoustic Office, Sound proof Office for our valued clients. These hoods are manufactured by making use supreme quality iron and other basic material and cutting edge technology. The offered products are deigned while keeping mind prevailing market demands so as to meet expectations of the clients. Furthermore, these hoods are available with us in different sizes to meet diversified demands of the clients. 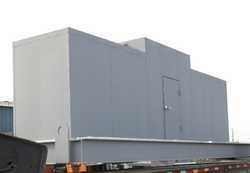 Our company is noted as one of the well-known manufacturers and suppliers ofModular Sound Proof Containers. 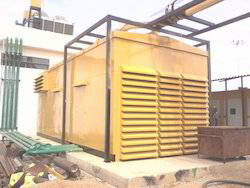 These enclosures are broadly used to store different kinds of machines like steam turbines, compressors, Blowers DG,s etc. Along with this, the offered range of acoustic enclosure is suitably checked on different characteristics to maintain its authenticity. Appreciated for its impeccable finish, fine polish and corrosion resistance nature our offered Modular Acoustic Enclosure is highly demanded in the market. Acoustic Doors for maintenance access equipped with superior quality Hinges, Lock, and Gaskets. Every Project includes Quality Assurance Plan / Bar chart / Drawings submittal. 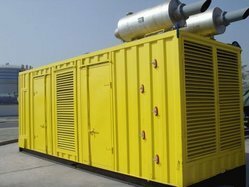 Sound Proof Generator Container offered by SRG International Pvt. Ltd. are designed by using latest by CAD-CAM technology to reduce noise (70 to 75 DBA) at 1 meters. Our Acoustic Enclosures have been designed and fabricated with tech-rich features, exhibiting the latest technology and trends in Modern day DG Sets. 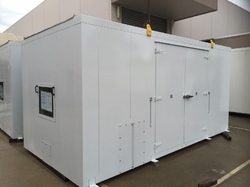 Available range for Acoustic Enclosure for DG Sets from 5 KVA to 1 MW. They reduce the sound level around the sound generating source. Theses Acoustic Enclosure are designed and compatible with the existing DG Sets. 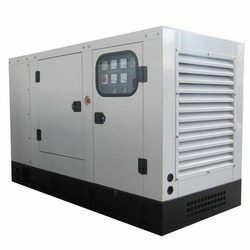 The enclosures are suitable all make gen sets like Cummins, Kirloskar, Caterpillar, Ashok Leylands, Eicher, Mahindra, Greaves etc. The purpose of Acoustic Enclosure is to minimize the noise created by machines. At SRG, We manufactured and Supply Notable ranges of Acoustic Enclosure. Here, we give the assurance of Accuracy, Durable finish and High quality of these products. These Acoustic enclosures can be widely used for indoor and outdoor installation, radiator and heat exchanger engines. These enclosures are manufactured using high grade basic materials which are procured from the established vendor of the industry. 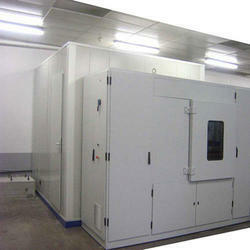 These Acoustic enclosures can be made as per the specification of the clients and delivered on timely basis. SRG International offering significantly Blowers Acoustic Enclosures, Acoustic Enclosure, Acoustic Hood for Blowers, Acoustic Hood for Compressor, Acoustic Hood for Cranes, Sound Proof Driver Room, Sound proof Enclosure, Acoustic Office, Sound proof Office for our valued clients. These hoods are manufactured by making use supreme quality iron and other basic material and cutting edge technology. The offered products are deigned while keeping mind prevailing market demands so as to meet expectations of the clients. Furthermore, these hoods are available with us in different sizes to meet diversified demands of the clients. SRG International offering significantly Compressors Acoustic Enclosures, Acoustic Enclosure, Acoustic Hood for Blowers, Acoustic Hood for Compressor, Acoustic Hood for Cranes, Sound Proof Driver Room, Sound proof Enclosure, Acoustic Office, Sound proof Office for our valued clients. These hoods are manufactured by making use supreme quality iron and other basic material and cutting edge technology. The offered products are deigned while keeping mind prevailing market demands so as to meet expectations of the clients. Furthermore, these hoods are available with us in different sizes to meet diversified demands of the clients. 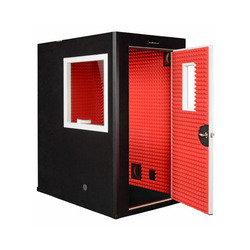 We offer Noise Control Enclosure to test each & every piece of product. These booths are designed with perfection, accuracy & new technology. The primary function of this booth is to control the shop floor noise and increase the accuracy of intensity measurement by reducing sound reflections. These booths are also use to find out defect in the product by using noise analysis method. Both sliding doors (material inlet & outlet) are automatic & synchronize with test panel, no need to pull / push material manually. We provide Room Acoustic Enclosure. 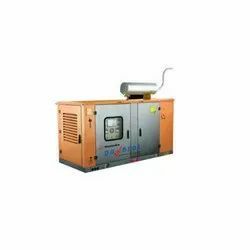 These are designed to control noise levels of engine driven sets, compressor, and pump systems. SRG International offering Sound Proof Generator Canopy for all Generator New or old from 5 Kva to 5000 Kva , we make fully customised canopy for Generator using best quality material and on CNC machines ,we also manufacture Blowers Acoustic Enclosures, Acoustic Enclosure, Acoustic Hood for Blowers, Acoustic Hood for Compressor, Acoustic Hood for Cranes, Sound Proof Driver Room, Sound proof Enclosure, Acoustic Office, Sound proof Office for our valued clients. These Generator Canopies are manufactured by making use of supreme quality iron and other basic material and cutting edge technology. The offered products are deigned while keeping mind prevailing market demands so as to meet expectations of the clients. Furthermore, these hoods are available with us in different sizes to meet diversified demands of the clients.